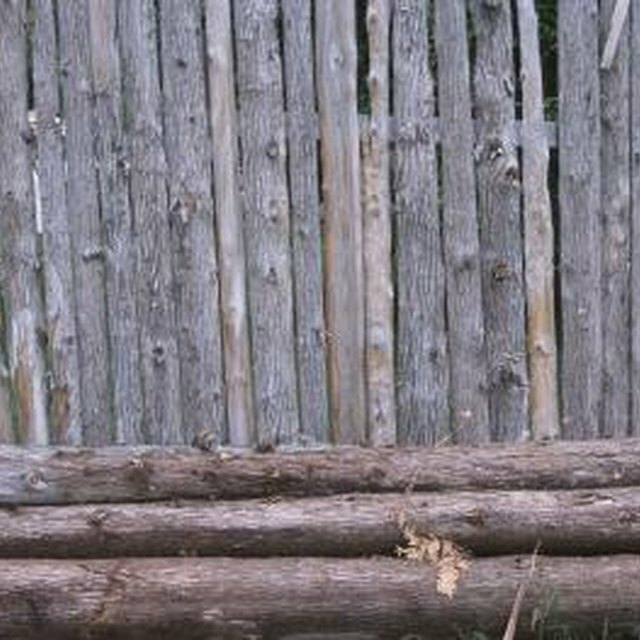 Buck and pole fencing consists of a series of upright A-frames made of larger timbers connected with thinner diameter wooden poles. This type of fencing is commonly used to protect areas from large herbivores, such as elk or deer. The design of the fence provides continuous, running coverage from one end of the fence to the other. While relatively expensive and labor-intensive to install, buck and pole fencing is more attractive and ecologically friendly than other types of manufactured fencing. Installation typically requirestwo to three people to handle the large posts and set up the fence. Buck and pole fencing keeps large animals out of protected areas. Set one 8-inch post on the ground at the location where it will stand in the fence. Lay the end of another 8-inch post across the first post so that they overlap about 1 foot from the end of each post and sit at a 60 degree angle. Set a 80D spike into the top post where the two posts meet. Drive the spike through the first post with a sledgehammer and into the second post. Lay the ends of the 6-foot. wooden pole across the ends of the posts to form and an A-frame. Nail the wooden pole to the wooden posts with 60D nails. Construct another A-frame in a similar manner 10 feet down along the fence line from the first A-frame. Stand the A-frames up and align them perpendicular to and centered along the fence line. Check the level of the A-frame. Brace each A-frame with two 6-foot poles. Place a 12-foot. pole across the outside post of each A-frame approximately 10 inches from the ground. Nail the pole to each A-frame. Place another 12-foot pole 1 foot above the first pole and nail in place. Continue this process with four more 12-foot poles, working up the outside of the fence to the crossover point of the posts in the A-frame. Place the remaining 12-foot pole across the inside post of each A-frame approximately 10 inches from the ground. Nail the pole to each A-frame. Remove the bracing poles on the A-frames. This completes a single section of the fence.